According to a report by the Wall Street Journal, Kodak hoped to earn $2.2 to $2.6 billion for its entire patent portfolio, but bids are currently around $500 million (up from the initial bids of $150-250 million). Last August, investment bank MDB Capital Group said Kodak's 1,100 digital-imaging patents (about a tenth of its entire patent portfolio) were worth $3 billion. In July, the Journal reported that Apple had joined Microsoft to bid against Google and various Android licensees. Now the paper is reporting that a consortium that includes Apple, Google, Samsung, LG and HTC is going up against Nathan Myhrvold's Intellectual Ventures, a firm often described by critics as a "patent troll" for seeking to enforce patent rights it has acquired rather than developed in the course of developing original products. The report also named RPX Corp as a bidder, a party which, like the Apple-Android consortium, seeks to buy up patents to protect its member companies from being sued by them. Previously, the Journal had described Apple as collaborating with Microsoft and Intellectual Ventures, while stating that Google and its Android licensees were aligned with RPX. Kodak hasn't yet decided how it will sell its patents or who the top bidders are; in a statement released yesterday, the company said that discussions with buyers were still active an ongoing. The company could package all 1,100 of its digital photography patents together, or carve out a subset, or back out of the sale entirely if it didn't think the sale was capable of generating enough money. Kodak is selling the patents in an effort to reorganize and emerge from its Chapter 11 bankruptcy proceedings it entered in January. 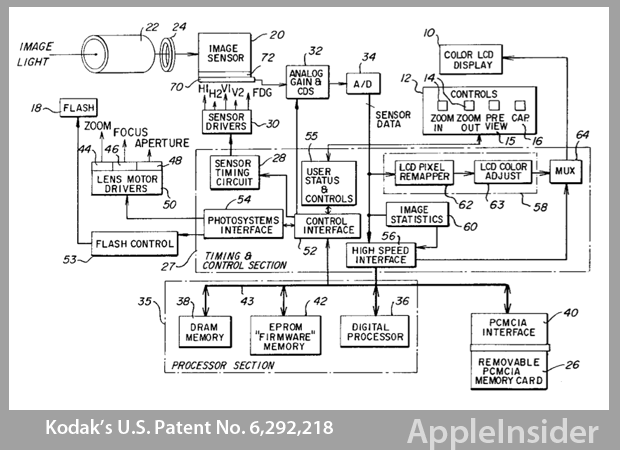 Apple disputed the validity of the patents after Kodak attempted to sue the company for infringement, its original plan for monetizing its patent portfolio. Apple claimed it had actually developed the work Kodak had patented after the two worked together on QuickTake cameras in the mid 1990s. A judge threw out most of Apple's ownership claims after deciding the company didn't act fast enough to claim ownership, but Apple was also exempted from paying a billion dollars in patent licensing fees that other firms, including Samsung and LG, had negotiated to pay the struggling firm. The market for patents appears to be cooling after a series of astronomical transactions including a $4.5 billion purchase of Nortel patents by a consortium including Apple, Microsoft, RIM and Sony (competitively bidding against Google) and Google's $12.5 billion acquisition of Motorola Mobility, which has so far resulted in very little patent value for the company.